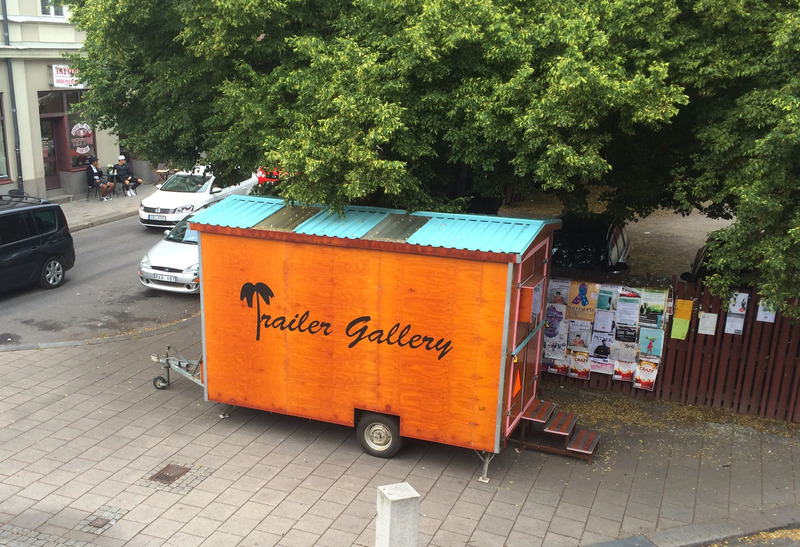 Trailer Gallery is a portable art scene and an experimental exhibition space created by Evelina Sjöström, Filippa Nilsson Kallhed and Erika Stöckel. The gallery is constructed on wheels which makes it possible to bring exhibitions to non-art spaces and meet a new audience. This gives the artists a unique opportunity to connect their exhibition to a site specific location. The grand opening took place in Umeå in the beginning of 2014. For one and a half year the gallery transformed every second week and hosted 24 exhibitions on different spots around the city. The summer of 2015 Trailer Gallery made a tour through Sweden. During two months we traveled across the country and collaborated with local artist, collectives and institutions. The gallery was used as a cinema, a dance scene, a museum, as a part of a sculpture park etc. In the end of the summer we had traveled over 4000 km and presented 12 different events along the way.